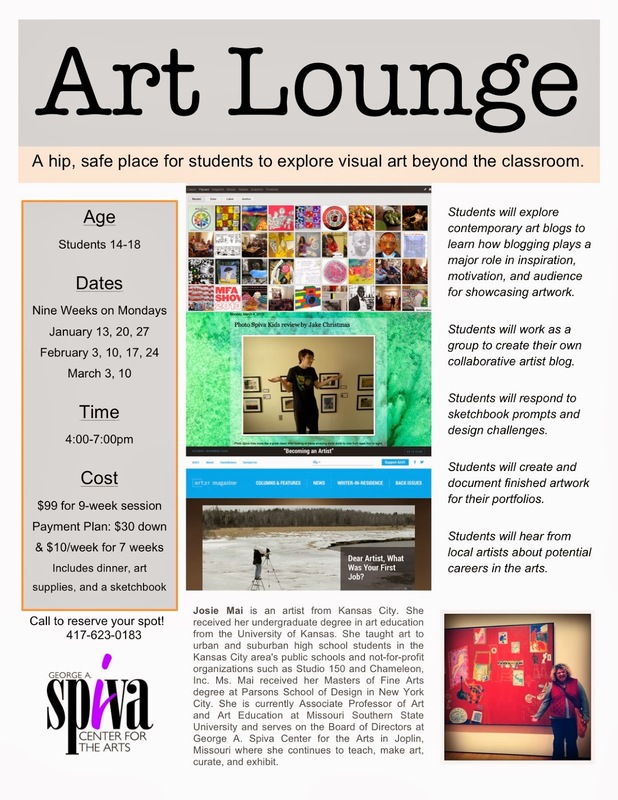 On November 18th, I had the opportunity to stop in to the last 2013 meeting of the current Art Lounge session at Spiva Center for the Arts. I talked about portfolios, sketchbooks, and arts careers with these eager Joplin-area high school students. Before the "lecture" and "discussion" though, I engaged them in a collaborative painting project. 10 of us moving among three pieces, painting with gouache from the center out. A wonderful critique happened at the end, where I asked them questions like, "Have you ever painted in a group? Ever painted on anyone else's painting? What was that like? Did you enjoy moving around and being more physical than usual in your art-making? Are these successful pieces? How would they look different if just one person made them? Proud and excited to announce that I will be teaching the Winter and Spring sessions of Art Lounge. Bring on the high school artists! I have things for them to do!